In a move toward commercial and military communication products, GFS Electronic Imports took on the Australian agency for the USA based company, Vigilant Systems. 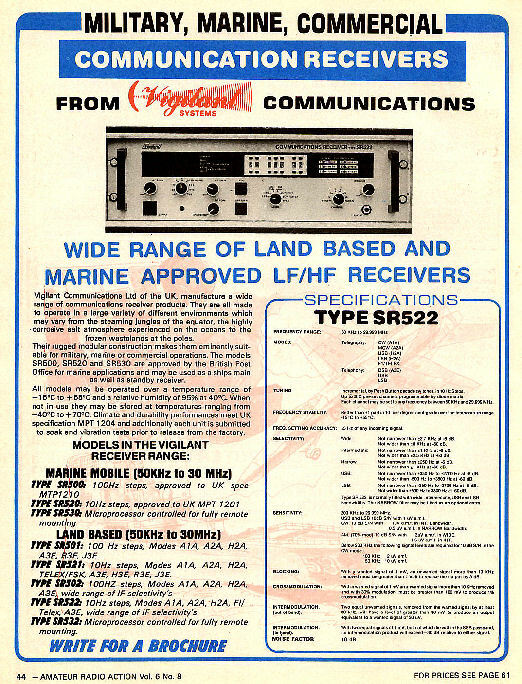 Vigilant Systems manufactured an number of commercial/military communication receivers as seen from the above 1984 GFS catalogue page. 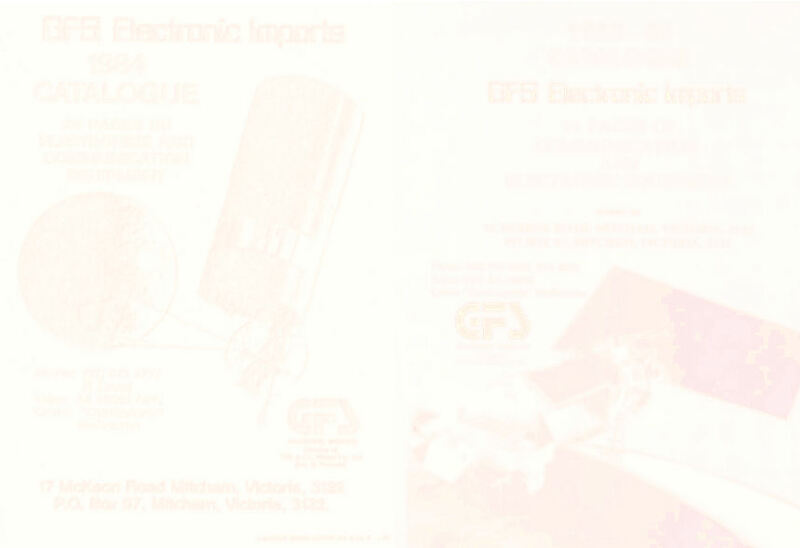 In 1984 GFS Electronic Imports were Australian distributors for the Japanese company, Standard Communication Corporation, which, at that time was owned by Philips however these days is owned by Yaesu. 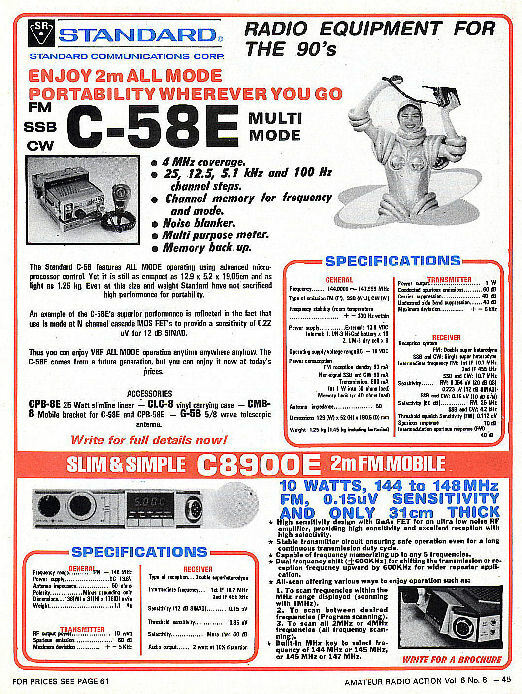 The 1984 Standard product range included mainly VHF and UHF equipment including the model C-58E multi-mode portable 2 metre transceiver shown below. Standard also manufactured one of the industry's first compact surface mount component 2 metre mobile FM transceivers, the model C8900E seen below. 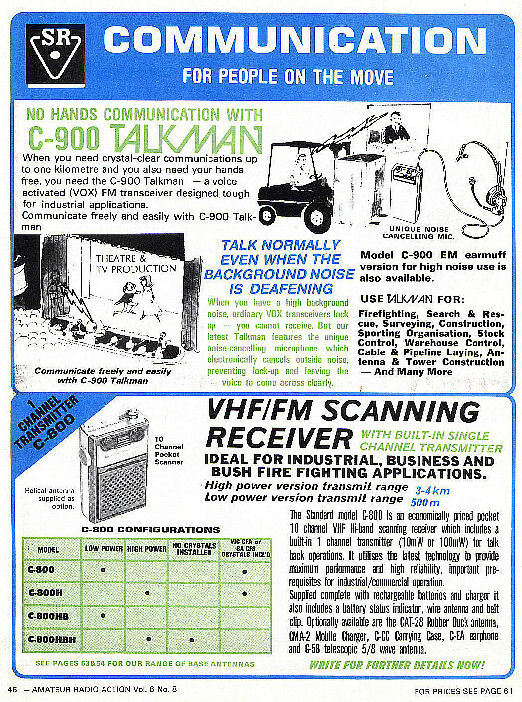 A popular commercial product for GFS Electronic Imports in 1984 was the Standard model C-900 Talkman. The Talkman was a low powered voice activated VHF headset transceiver operating in the license free 55 MHz band, as such it found it's way into many commercial and industrial applications. 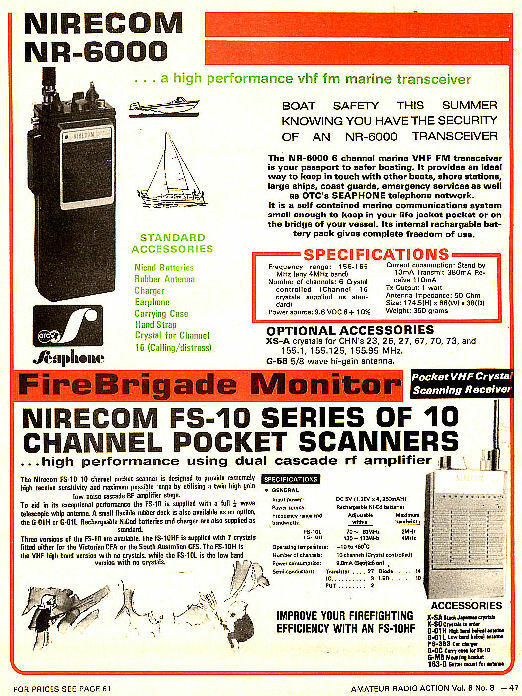 Since GFS Electronics had started in the late 1970's, they had provided the the volunteer country fire fighters with small VHF FM monitoring receivers, these included the PK1 as well as the Nirecom model FS-10 shown below. A variation to this theme was the Standard model C-800, a VHF pocket scanning receiver with a 10 milliwatt or 100 milliwatt low powered built in transmitter. The C-800, shown above, allowed communication over a short range without the need for an expensive VHF transceiver. Another product made by Nirecom and shown below was a handheld VHF FM marine transceiver, the model NR-6000, which covered the VHF FM Marine band, including OTC's Seaphone channels. 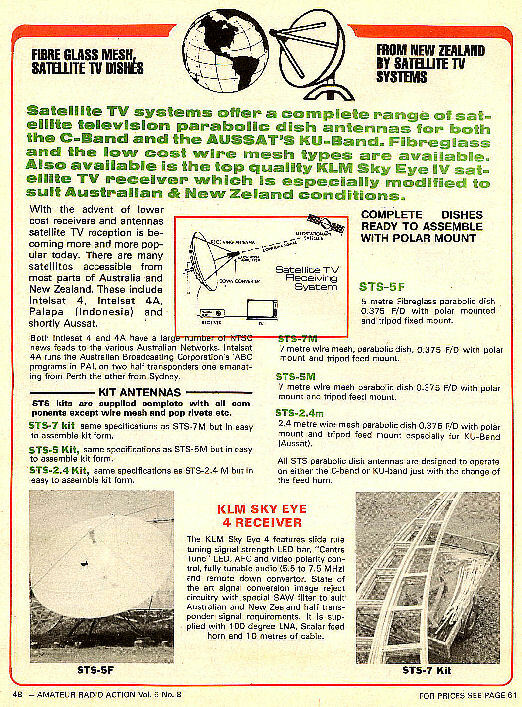 By 1984 GFS Electronic Imports were handling a range of Satellite TVRO (TV Receive Only) dish antennas and receivers such as those shown above. 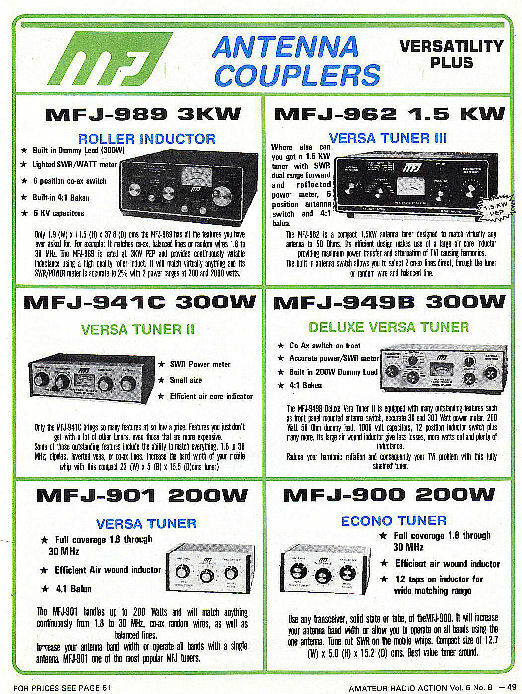 MFJ Enterprise's of Starkville, Mississippi, USA, made a large antenna tuner product range, most of which GFS Electronic Imports sold in Australia and are shown on the catalogue page above.